Every single being has an inherent need to dominate. Survival triggers the need for dominance. The desire for dominance is as strong as the instinct to survive. Although some people have diminished their quest for dominance, most likely due to previous failures at the attempt. But their desire is still there and is only hidden away. Just a little spark will awaken the desire. When you want to succeed, you want to dominate. When you are in a competition, you want to dominate. When you want to get promoted and improve your earning capacity you want to dominate. Even just to get a piece of the action, you need to dominate. However, dominance must be tempered with the principles and guidelines of Universal Stewardship. Dominance without kindness and respect is the mode of the bully. What do the religions of the world do to gain more followers? They build on dominance. What do countries do to build their prosperity? They dominate. What do corporations do to corner the market? They negotiate to dominate. Those who can’t dominate on their own, form alliances. Those who realize that dominance is not sustainable learn to cooperate. However, once prosperity is achieved via cooperation or alliance, somehow, greed has its way to bring back dominance to the surface. The combination of trade, power and influence are the tools in building dominance. Trading in simply a form of an exchange. Depending on supply and demand, trading will require negotiation and bargaining. Once one side feels that it has the upper hand, then the idea of dominance creeps in. The quest for dominion via trade, power and influence always linger. It never goes away. Universal Stewardship does not advocate any government or any religion. However, we do insist that government must be kept separate form religions or any ideologies. We ask our followers to do their duty to God and their country and follow the principles and the guidelines of universal stewardship. The order of things are as follows: God, self, country(tribe), religion(ideology). Let us not ever forget that. Universal Stewardship is not about religion or country. It is about God’s creation. Guilt and Shame are emotions. We need emotion. We are humans. Guilt and Shame are associated with fear. The fear of rejection, the fear of not belonging, the fear of depriving someone or being deprived, the fear of cheating or being cheated by the person we love drives this feeling of guilt and shame. The need for accountability is strong in humans. Guilt is a personal self-conscious emotion generated from the individual’s thoughts, words, and deeds. Whenever we realize that we knowingly deprived someone who did not deserve deprivation, we feel that we have done something wrong and somehow yearn to have it corrected and this is “guilt” in action. Shame on the other hand is a self-inflicted emotion. Shame is wake up call. Shame erases vanity. Shame makes an individual focus on himself as a failure (in public). Shame diminishes a person’s self-esteem towards others. Through guilt and shame the spiritual leader was able to build his group of followers. Why do children feel ashamed? Why do they sometimes feel uncomfortable to step up and be recognized? Why are some children more sheepish than others? These behaviors are developed behaviors during the formative years of the child. It is true that there are children who are not as aggressive or as outgoing as others. But this has nothing to do with negative feelings or behaviors that a child has developed. Lack of discipline and education or too much of both can create these negative behavior. 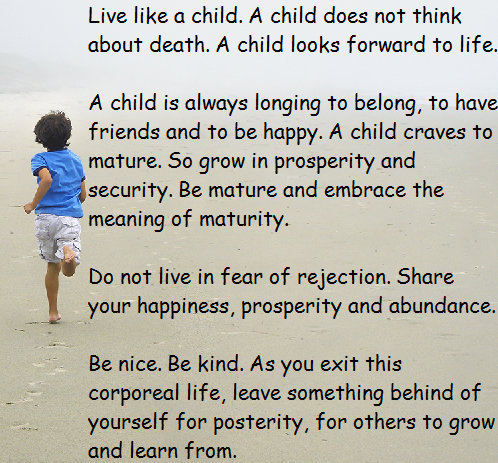 A child must grow with love, prudence, respect, kindness, gratitude, apology and forgiveness. As humans, it is our nature to be on a quest. Our origin is our past and we are heading for the future with multitudes of stopovers. There is no destination, just stopovers in our journey to discover ourselves. It is the journey that makes us who we are. The more emotion we pour into our journey the more we improve. Without emotion, we are nothing. Positive or Negative, we have to give it our all. The “Positive” or the “Negative” are simply the tools of our journey. We have the freedom of choice and the power to reason. Exercise this power and you will transform. The choices you make can either make you and others happy or sad. Anything and everything that you want or could possibly want has already been provided and presented to you or laid out for you by God. You have to make your move to help yourself. Do your best to be aware of your surroundings. Everything around you is to be learned from. You can even learn from distractions. However, to achieve your goals, you must stay focused on the activity of your choice at any particular moment. Remember your experiences. This is easier said than done. At the end of each day, thank God for all your experiences by helping others. Yes be they positive or negative, thank God that you are alive to experience them by making yourself a better person. Never ever blame God for the negatives in your life. You must learn from all the experiences in your journey. Learn to forgive yourself and others. Forgiveness is a great equalizer and it helps balance your life. Don’t get wrapped up in the in the negatives. Learn from them and move on to be a better person the next day. Try to be happy. Smile and dance more often. Reminisce. Discover yourself. The happiness switch is automatically turned on when you dance. It takes a lot of effort to stay angry when you are dancing. 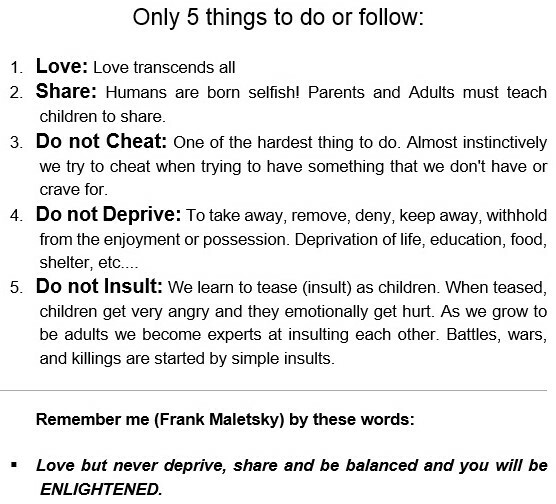 Be balanced, share, and try to Love. When your corporeal life ends, you will be held accountable for all your thoughts, words and deeds. Then this is carried forward to the spirit world where your journey continues. How will the association earn to support, protect and sustain itself and continue to be able to help others? Income from the academy will help. The tuition from students will help support and sustain the school system. Donations and grants from alumni will also help. Children of employees of the association (or employees themselves) will have free scholarship. No tuition to be paid. The association will gear itself towards agriculture, forestry, and aquaculture, all the while practicing sustainable farming. This will generate income and help provide organic food for the human race. Lease or own lands for forestry and lumber. Lease or own water rights or natural resources when available. The association will create sustainable energy for the public. Sold to the general public via government permits and licenses. Tidal wave and sea current power generators. More attention will be given to geo-thermal and sea current source of energy. Source of energy for these two rarely fluctuate. Power storage(batteries) will not be required. Alternative sustainable energies will always be developed. Research on storage of energy will be an on-going project of the association. The association will own and build shelters for the public to rent at reasonable and affordable rates. The association will have a “personnel staffing” company. This will allow the association to spread out to all areas of businesses to provide them with their staffing needs. Most of all this will help the association create the security personnel system (via security staffing) to protect itself from predators, by ways of laws and physical force. The association will own or invest in (common stocks) of public corporations. Invest in logistics and transportation companies using sustainable fuels instead of fossil fuel or fuels detrimental to the environment. Invest in eco-friendly corporations (common stocks). Portion of the profits from these investments will go to the FREE healthcare of all employees of the association via enrollment with health insurance companies within the locality of the employees. A minimum of 20 hours work per week will qualify an employee for this free health insurance, with a minimum 3 month employment. All co-pays will be paid by the association. Upon termination of employment all benefits will be cancelled. However, employees with 20 years or more of service are entitled to a lifetime of free health care coverage from this universal form of healthcare. Employees with 30 years of service will receive a pension plan (compensation comparable to government retirement pays) and the free health plan continues to be in effect. The association will create a licensed Long-term Universal Health Care facility for the elderly members of the association. This will be free. Funding will come from the association and from donations of members. The association will maintain a research and development team. To always build Schools or Academies whenever capital is available, to enable the continued spreading of the principles and rules of universal stewardship. The association will also invest in private tertiary education and “further” education school corporations. Investment in these schools will not simply be intended for income generation but more so for the creation of influence in the level of education. Education for the betterment of humanity and the prosperity of citizens by providing continued education for those whose skills were taken over by technology or disability. Save the rivers, lakes, seas and all bodies of water. Reforest the mountains, watersheds, and coastlines. Work with other organizations who are into the conservation of nature and resources. Foster and help build the economy and technology of nations.